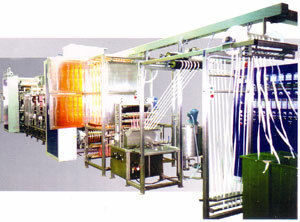 The model is the automatic high-efficient narrow fabric dyeing machine. It is widely used in dyeing of nylon tapes, laces, bras, shoulder straps and elastic briefs. Equipped with the tension adjuster for balance of the tension, the luster after processing is even, bright and beautiful. Tape outlet device with anti-static unit. The model is especially designed for small and medium but diversified production. It’s widely used in dyeing of nylon tapes, laces, bras, shoulder straps and elastic briefs. Equipped with the tension adjuster for balance of the tension, the luster after processing is even, bright and beautiful. 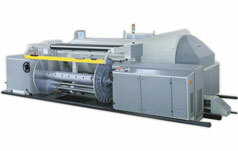 The model is designed for multi-purposes, and suitable for dyeing of lighter and thinner narrow fabrics. It fits polyester, nylon and cotton materials. 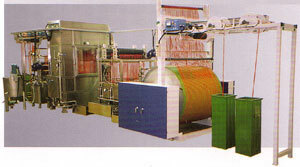 The unique infrared pre-dryer will prevent the migration of the dyestuff, and speed up the fixation. From dyeing →infrared pre-dryer → color fixing → steaming → washing tank → starching → drying and finishing → tape outlet, the whole process is under continuous and consecutive production. Each part is equipped with independent motor and tension controller. The motor speed is adjustable according to the tape’s material, bleaching, and light or dark-color dyeing. The infrared fluorescent tube is installed in the sliding carriage. In case the machine suddenly stopped, this sliding carriage would move backwards from tape’s route by means of pneumatic unit, avoiding being burned under the high temperature. After its re-start, the infrared sliding carriage will automatically move back to the working area. Stainless Steel Steam drying cylinder.